It is no exaggeration to say that the history of ARKRAY mirrors the changes in Blood Glucose Monitoring. In the 1960s it was EYETONE from ARKRAY that enabled blood glucose test strips developed in USA to be measured in small devices and this was a world first. The term small may seem a little misleading because these small meters were not like the small meters of today, fitting into a breast pocket. They were about the size of two video cassettes stacked in top of each other. On top of this the display was not digital like we see today, but an analogue meter using a needle gauge. Reagent reaction time was two minutes and after that, the user had to wash the reagent and carefully wipe away the water. By the standards of today, this is hardly something that we would call quick and simple. ARKRAY then succeeded in developing an easy-wipe film test strip as well as shortening the reaction time from 2 to 1 minute. 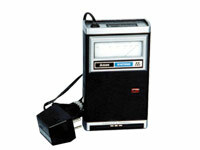 Advances were made in changing over to a digital display and scaling down the size. In 1989 the first breast pocket-sized unit, the Toecho III, was developed. As ARKRAY moved into the 1990s the switch began to be made from the color comparison method to enzymatic/electrode methods, eventually leading to the current GLUCOCARD that you can see today. Color comparison or electrode method? Visual check was possible but results varied according to the operator's technique. Cleaning and wiping were no longer required and the operator's technique ceased to be such a great source of disparity. Current generated from chemical reaction is measured under the enzymatic electrode method. (Present)This is the main type of measurement method used currently. Non-invasive method requiring no blood sampling. (Future)Research continues into near infrared method and a method using intercellular fluid. Within the above classification of BGM generations, it is also correct to say that the step between the second and third stages was significant. The advantage of the color comparison system was that even if the system broke, a visual measurement could still be performed and a rough result obtained although the process of cleaning and wiping was a troublesome necessity. Yet, if the machine using the electrode method failed, there was no way for the patient to know the result of their test. On the other hand it required no cleaning and wiping and was simpler and easier to use. There was much debate within the company as to whether we should continue with the color comparison method or move into the electrode method. We eventually settled on the electrode method because the system rarely failed. 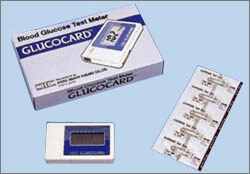 This was the beginning of the first incarnation of the GLUCOCARD that you can see today. 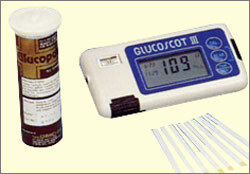 The GLUCOCARD became a big hit and its ease of use and reliability resulted in support from medical professionals and patients. In 1986 self blood glucose measurement for patients who injected themselves with insulin became covered by insurance and this partly led to the level of recognition that made it the de facto standard for BGM in Japan. Amongst our competitors, there are those who, since the early 1990s have used over 4 different platforms (compatible reagents) for both the color comparison and electrode methods. However, only ARKRAY were able to reduce measurement time and the volume of patient sample on the same platform. There were many model changes but the measurement operation has been the same as it was in the first model. This is probably one of the factors that earned it its reputation amongst users as a reliable instrument.